A group of secured features is called a Role. Roles are security profiles that can be assigned to one or many Users. 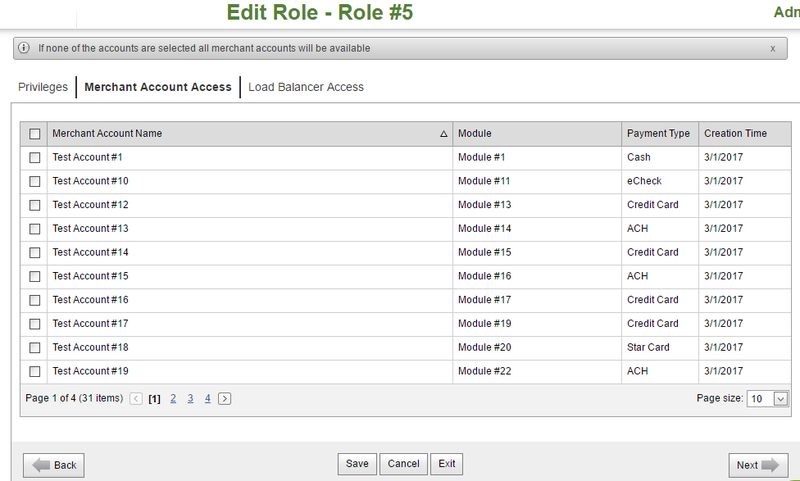 By clicking the Roles menu option in Security, the merchant may view, edit, add or delete roles. Step 1: Select Roles from the menu Security. Step 2: Click Add Role. Step 3: Enter the role Name and Description. Step 4: Click the appropriate security option checkboxes for the Role being created. Set Role Privileges: Privileges determines the security profile for the Role. A description of each Privilege can be found next to each individual function. Tip: You may use the Collapse All Rows or Expand All Rows buttons to quickly assign and remove security features from the Role. Step 8: Select Load Balancers that must be available for this role. If none of the load balancers are selected all load balancers will be available. Step 1: Click Edit next to the Role being changed. Step 2: Modify Role on the Edit Role page. Step 1: To Delete a Role, click the Delete link next to the Role you want to remove. The system will ask the user to confirm the Delete. Note, that you can not delete a Role, if it is assigned to a user.